Something was missing in South Bend, Indiana. Streets seemed too big for the few cars that drove around. In the centre of town, many buildings stood empty. Outside town, rusting hangars and production facilities stood idle. What was missing, I realized, were people. This region's golden era lay in its past. Much has been said and written about the impact of globalization. Macro-economic data tell us on aggregate who wins big, and who doesn’t. But the theory is clear: by expanding trade, everybody gains at least a little. Yet broad-based facts and figures don’t tell the whole story. Some cities have been hollowed out over the past few decades. They have endured mass lay-offs, rising unemployment, depopulation and overall economic decline. The scene I saw in South Bend is replicated in many parts of the Midwest, the Carolinas and elsewhere. According to researchers, one other city stands out in particular: Dayton, Ohio. But is globalization to blame for the tough times that South Bend and Dayton have endured? Many factors play a role in explaining the gains and losses in our economy. But globalization is a particularly important factor, in public opinion. Depending on which arguments you believe, globalization is either responsible for the largest ever wealth boom, or the ills that many people are facing. From a statistical perspective, it is clear why: exports today account for a whopping 21% of global GDP, up from 13% before the fall of the Iron Curtain, and 5% after the Second World War. Ours is the most globalized era ever. But what does globalization have to do with the rise and fall of cities? Looking at cities such as Dayton, the link seems obvious. Until around 1990, car-maker General Motors (GM) employed more than 20,000 people in the city and its surroundings, the Reason Foundation reported. A short while afterwards, the US enacted NAFTA, a major free trade agreement with Mexico and Canada. In 2001, China entered the World Trade Organization. By 2008, only about 12,000 GM workers were left. From 2000 to 2009, the city lost 7.2% of its population. Such historic correlations fit into a bigger picture. Globalization has narrowed inequality between countries, but increased inequality within developed economies. According to various economists, including Thomas Piketty and Branko Milanovic, many groups benefited from increased trade in the last few decades, but not America’s middle class. 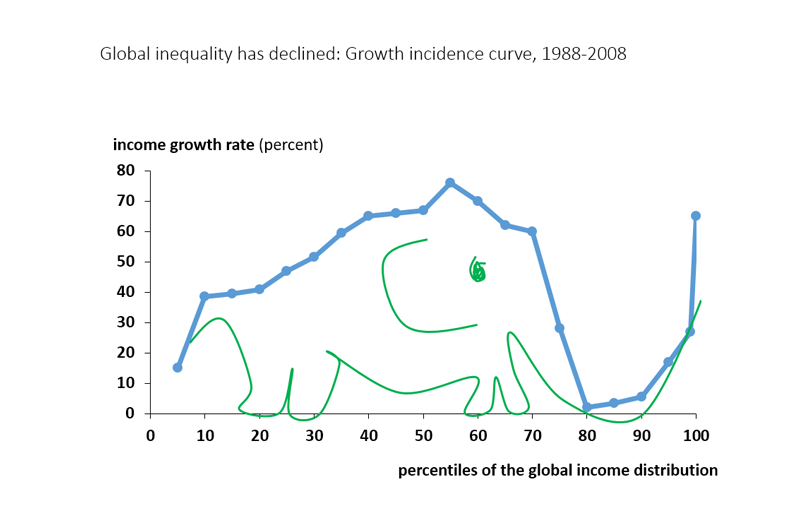 The most famous graph depicting this is dubbed 'The Elephant in the Room'. It shows that while the world’s poorest and richest made huge leaps forward in the era of Dayton’s decline, the West’s middle classes made virtually no progress. The world’s 80th to 90th percentile richest people - America’s and Europe’s middle class - gained almost nothing in the period between 1988 and 2008, the boom years of globalization. Since the Elephant graph was released, many have pointed out its shortcomings. For example, it doesn’t account for all the income people have, only the income they report in tax returns. Moreover, those who were in the 80th percentile in 1988 are not necessarily those who are there in 2008. But no one ever really disputed what people in Dayton and South Bend already knew from experience: life didn’t get much better at all for many in America’s middle class as globalization reached its peak. It is clear that globalization has led to a net loss of jobs in Dayton, South Bend and around the US. How many? In 2016, the Financial Times tried to do the impossible and calculate exactly how many jobs were lost because of globalization in America. Their conclusion: of the 5.6 million jobs that disappeared in manufacturing in the US between 1990 and 2016, almost half - 2.3 million - may have been 'saved' if production had remained in America, and if consumption had remained as strong as it was in 1990. That figure fits in the ballpark of other research estimates. By one count, Mexico gained 400,000 manufacturing jobs since accessing NAFTA, while China absorbed one sixth of America’s lost manufacturing jobs. But these figures still leave millions of lost jobs in America - thousands of them in Dayton - unexplained. So where did these go? As time goes on, one factor may have had a more dominant role in these job losses: technology. Technology has always played a major role in economic development. For Dayton, it has been no different. During the city’s first big period of growth at the turn of the 20th century, "Dayton showed an ability to adapt to widespread technological change", writes Adam Milsap of George Mason University. But while the city successfully harnessed technology more than a century ago, it has not been able to do so in the past few decades. In this, it’s not alone. Indeed, while quite a few American jobs lost in the late 20th century were shipped to lower-cost countries such as Mexico, the story changed from about 2000. "Most of the manufacturing jobs lost in the 2000s resulted from technological change such as automation", according to Brookings. It probably doesn’t matter much to people in South Bend and Dayton to know that their city’s decline was due not only to globalization, but also to technology. Nevertheless, two things are worth pointing out going forward. Firstly, globalization, for all the vices it has delivered to Western manufacturing cities, still brought and brings benefits. As manufactured products became cheaper, people everywhere in America started spending more money on services. I could see this in South Bend. Hip new coffee shops, restaurants and barber shops have started to reoccupy what were once industrial buildings. Secondly, with the economy transforming itself once more, new opportunities arise again. For inspiration, Dayton need not look far. Just 70 miles away, Columbus, another old Midwestern industrial city, is thriving. The city attracts young and educated people, and its entrepreneurs are reinventing how old spaces can be used. "Columbus is thriving because we are smart and we're open,” its City Council President Shannon Hardin said. Even if replicating Columbus isn’t possible, Dayton and South Bend could work on some crucial levers to improve their outlook. Overall, America is already the most competitive economy in the world. But there are three places where it lags: its healthcare, its 'social fabric' - the way people interact in communities - and its adoption of information and communication technologies. Public or private initiatives that address these three elements will boost these cities' prospects. Dayton is already doing this. According to NBC, its downtown’s largest and fastest-growing employer is CareSource, a nonprofit managed care company. If cities such as Dayton and South Bend continue to work on these priorities, they might be able to regain lost ground. "Evidence suggests that cities can gain a competitive edge by attracting risk-loving individuals who increase the probability of innovation occurring in the city", writes Adam Milsap. Dayton used to be one of the most innovative cities in America, he adds. With the right attitude and the right policies, it can perhaps become so again.